Kafka Lounge – Part 4 – Completed! Sorry for the length of time between posts! Unfortunately time got a little short before my wedding, and thus the updates on the Kafka lounge have had to wait, however I was able to complete the freshen up before the big day, and use it exactly how I had planned! 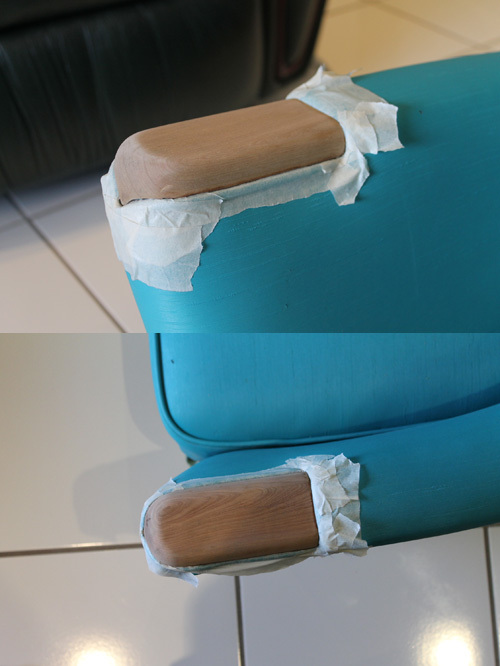 I left you with the hand rests sanded, and ready for the finish to be applied. As they are firmly attached, removing wasn’t an option, so to prevent any of the finish getting on that majestic coloured vinyl, good old masking tape was used. Fiddly, however once on I didn’t have to be too concerned about any spillage or runs staining the vinyl! Once done, the finish was ready to be applied. 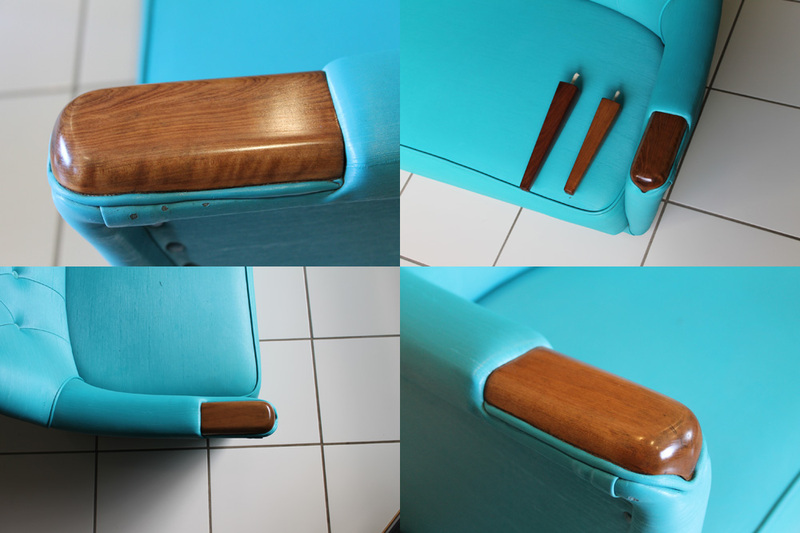 In my very first post about the lounge I mentioned the different timbers used and how matching hand rests to the darker teak legs may be a little difficult. To try and darken the coachwood (hand rests) I experimented with a few different stains, and applications, and eventually settled on a mixture of 10:1 – being 10 parts danish oil to 1 part teak stain. 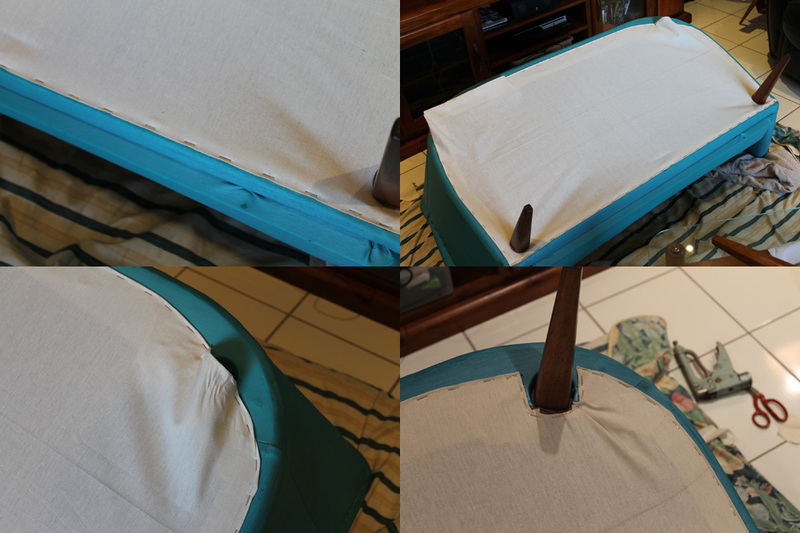 Mixed together and applied with a soft, cotton cloth I was extremely happy with the results after 4 coats were applied. It really highlighted that grain in the left hand side hand rest! With all the timber work now complete, all that was left was to fit the cheesecloth to the underside to cover up the ‘internals’, refit the timber legs and give the lounge a quick wipe over once more with the vinyl conditioner!